I did not expect to enjoy this as much as I did. 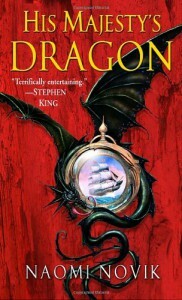 Beyond the absolutely endearing dragon (and a book-lover dragon at that, how can you pack more win?) and the lovely friendship with Laurence, the setting goes into many issues I would not have expected it to, but that would be the logical result of dragons existing, being intelligent, and drafted into the military. It made me laugh, and think, and I mowed through most of it in one sitting. Full stars.